An enjoyable painting session last week. I feel the fun coming back into my paintings. I knew that all that playing with crayons and colour swatches would make me happy! And I'm starting to come to a realisation that skies is what I love painting. So maybe, just maybe, I need to indulge myself!! Work in progress - I've actually only painted the sky so far!! This is a view from the back of the pitches in Belfield. I love big skies! Another version of the Healy Pass - this is more about the rocks, but never mind! There is nothing I love more than painting watercolour swatches! A wonderful way to discover new favourite mixes, like ultramarine + bloodstone genuine, or PG50+Pyrrole red! Sketching Now Watercolour is the best antidote to the January blues!! Pick up your paint brush, know how much water is on your brush, and let the paint do its magic is the best way to summarise it!! I love pens for sketching. For the last year or so, I've been sketching with a Lamy Safari, an inexpensive pen that flows beautifully on the page. I had heard about Fude pens a while back, but I felt I had enough on my hands with just one type of pen. But I let myself be tempted after the holidays. Fude is a generic term - the word 'fude' means 'brush' in Japanese. Yet, this is not a brush pen. It's a fountain pen with a bent nib. The one I got is 40 degrees bent I think. There is also a 55degrees one available. The finest mark is obtained by turning the pen over; the next finest by holding it vertical, and the line gets thicker as you hold it at a smaller angle over the page. For now, I'm just exploring what it can do, but I think I will need a lot more practise to get a fluid, calligraphy effect! Maybe sketching a cup wasn't a good idea? Last week was colour week on Sketchbook Skool One Drawing A Day, with Veronica Lawlor, a wonderful art instructor. And what fun it was. No big expectation. Permission to play with crayons, coloured pencils and markers. Just my cup of tea. And a perfect antidote to the bleak January weather. I loved this one: drawing a flower with a crayon, using the local colour for one version, and random colours for the other. Drawing clouds was fun, although I have to admit I was more inspired by the ominous-looking storm clouds than by the pretty sunrise. Since I don't have any crayons, I am using my Neocolor II in these exercises. They are water-soluble, so I drifted away from line drawing. For the next exercise, I set up a still life with familiar objects and drew with a pen, then coloured in, at first with pencil, but then I added oil pastel, and I kept going until almost every surface was covered in colour. And it didn't matter than my cups were all wobbly! Trying to paint more freely in watercolours. Before Christmas, I was really struggling, feeling like I would never recapture the fun of of watercolour. So, after a good bit of soul searching over the holidays, I've decided to not even think about the end product, just about process and exploration. Nothing frameable might come out of it, but I needed to let go of the pressure I put on myself, and just follow my instincts. So, this is the current work in progress - lots of happy colours and not-so-happy accidents. But where's the fun if you don't take risks? Weekend away near Oranmore last week. Wonderful to be in the West. The weather was better than forecast. And the light in the West has a certain quality that's hard to describe - a softness and a sharpness at the same time. Like light and dark, sunshine and rain. That's how they get the rainbows! Loved the company of old friends. Chats about the state of the world, philosophy, religion, art, music, India, meditation, etc... This would be a perfect location for an artists' retreat! For now, it's an AirBnB in case you're interested!! Lovely location by the sea, close to Galway city, and also to the Burren. It's really hard to sketch friends, much harder than strangers. Because I care about how they'll feel when they see how I represented them. I think one out of the three was happy enough, one neutral, and one not too happy. And, to balance the page, I added my favourite quote of the moment. Ann is so talented - she can play the guitar, the ukulele, the fiddle, and probably any other instrument you put in her hands. And she can sing too. The landscape is the view from my window when I got up on the Sunday morning (Art before Breakfast indeed - Danny Gregory has a lot to answer for). The paint took a lot longer to dry than what I'm used to, hence the blurry bits. It's damp in the West in the winter, even in a well-heated house! And in case you're thinking I'm a Foster & Allen fan, I'm not. Just to be clear. The effect of the prevailing wind on the tree in front of the house. I finished the sketch when I got home. And this is the barn behind the house next door. Lots of moss on that roof! I can picture this barn as a workshop space for art groups!! This one I did from a photo I took while walking around the bay. And here are the same two pictures as a double spread in my sketchbook. I think they go well together. Tried to sketch Ann in Nockton's (Tigh Neachtain) in Galway but failed miserably. Although, if I look at the picture on the right, the (left - clearly, since there is no right eye in my sketch) eye looks just like her (although now that I think of it that's her right eye, isn't it)! Maybe the glass of Guinness was starting to relax me! Tried to draw her again at home when she was playing the guitar. Harder than I thought it would be. I added the patterned background later. But maybe those small sketches helped me capture the essence of her when I moved to watercolours! 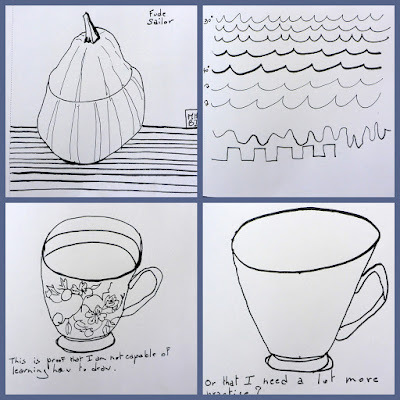 A few more drawings from One Drawing A Day, exploring textures, doodles and patterns. A great excuse for using my calligraphy markers - they languished in a drawer for years, and I'm so glad to have found a use for them at last. They are so much fun! I'm really enjoying this course, by the way. The modules are short and snappy, and there are 5 a week, so it's easy to catch up if you miss a few days, which I did as I was busy at the end of last week and I was away for the weekend. You'll find the course on Sketchbook Skool (yes, with a k). So, yes, it's been a prolific start to the year. The beauty of it is that none of these sketches have taken me more than half an hour, so it's quite manageable, and an encouragement to keep it up! Veronica Lawlor, who runs this course, is a fantastic artist and a great inspiration. She has a couple of books, One Drawing A Day, and One Watercolour A Day. But I find the online course much easier to follow!! It's all a matter of motivation, I think. The first sketch here is actually the last one from the week. I decided to put it here first just in case you get bored and don't scroll down!! A view from an upstairs window. The weather has been too miserable to sketch outdoors, but I don't want to draw from a photo if I can avoid it! Some of these patterns didn't quite work out at the start, but then I got into a rhythm. The idea was to be inspired by patterns that you find in magazines. A few here are from origami paper, and others from Ikea napkins! I wasn't at my most inspired for the first Dublin Sketchers outing of the year. Well, I was prolific - 4 sketches. That's something But I wasn't very focused. I added a bit of colour to 3 of them after I got home, and I was much happier then. I am definitely a colour person, rather than a line person. The National Gallery was very busy. Lots of people for the talk on the Turner exhibition. And the place was just humming. I even managed to get in with my sketching stool hanging from my shoulder. The 'item' for which I was stopped the last time! Mind you, I wasn't carrying a backpack this time. So I didn't stand out so much. I've just seen that there is an Emil Nolde exhibition coming up in mid-February. I'm soooo looking forward to that!! These two were done while sitting at the lecture on the Turner exhibition (on until the end of January) - some fantastic works by Niall Naessens, responding to Turner's works with prints especially made for this exhibition. With a few quotes from the speaker, Anne Hodge, who curated the exhibition. A view from one of the balconies near the big elevator. A view I definitely want to revisit. It was a bit draughty on the bench outside the shop, so I rushed this sketch. But adding watercolour highlights when I got home made me happier with it. While I write this, it reminds me of how slow the service was in the café - lots of staff behind the counter, but only one or two actually looking after customers. The rest of them seemed to be busier with ... I don't know what? I tried twice and gave up both times. That's not the first time it's happened. How can they be so inefficient? Is it the layout? Or the management? The shop, on the other hand, is lovely. Now, I didn't try to buy anything, so I can't comment on their efficiency. But they have wonderful art books, prints, cards, and gorgeous scarves too! A brief revival of the "What I'm wearing today" series. (Roadkill hat bought in New Zealand 10 years ago, Costelloe+Costelloe scarf, Dunnes Stores long coat, mittens, jeans, boots, warm socks. Thermal underwear not shown). Never mind the thermals, I hear you say - but 'roadkill hat'? Really? Yes, really. It's 10 years old. And I bought it in New Zealand, at Lake Tekapo. It's a wool hat, made from the fur of small animals killed on the roads. Another memory of Lake Tekapo was an amazing sushi lunch. I don't think I ever ate so much sushi in my life! I wasn't a sketcher then, or I would have the evidence! 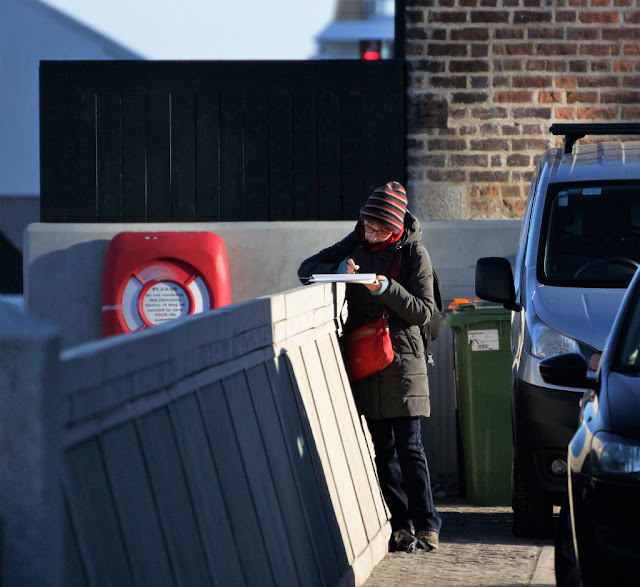 Sketching in Dublin in the winter is not for the faint-hearted - but at least it's not -35C, so my fingers are still attached. I just had to move to stay in the sun and keep warm. We rarely get temperatures below 0C actually, but the damp and the wind present extra challenges. This outfit is actually not that different from what I wear for about 10 months of the year. I sketch all year round. No point in waiting for the good weather or even summer. It may not show up for a few years. Dublin is not LA. A quick outing while I was in town with BB. And an opportunity to do my outdoor assignment for A Drawing A Day - playing with lots of different lines. Cranes are back in the Dublin skies, with the construction industry booming. And yet, we have a huge homeless problem. It makes no sense. This is the Samuel Beckett Bridge, one of our newish bridges over the Liffey. Some call it the Ryanair bridge. All inspired by the traditional Irish harp of course!! I didn't do it justice. I was interested in the shape of the little pedestrian bridge. It stands out more in the thumbnail. Maybe I should draw it in black? A few icons of the Dublin skyline in the background: Liberty Hall, the Spire, the Custom House. Don't you just love Dublin? I was going to post a few photos, but this short video is all that's needed, I think. Killiney Beach - the best place in the world for a winter walk! On mature reflection, I can't resist adding a few photos. If I don't put them up here, they'll just disappear in my Pictures folder, never to be looked at again. And they deserve a better fate. Plus I might want to paint some of these scenes! 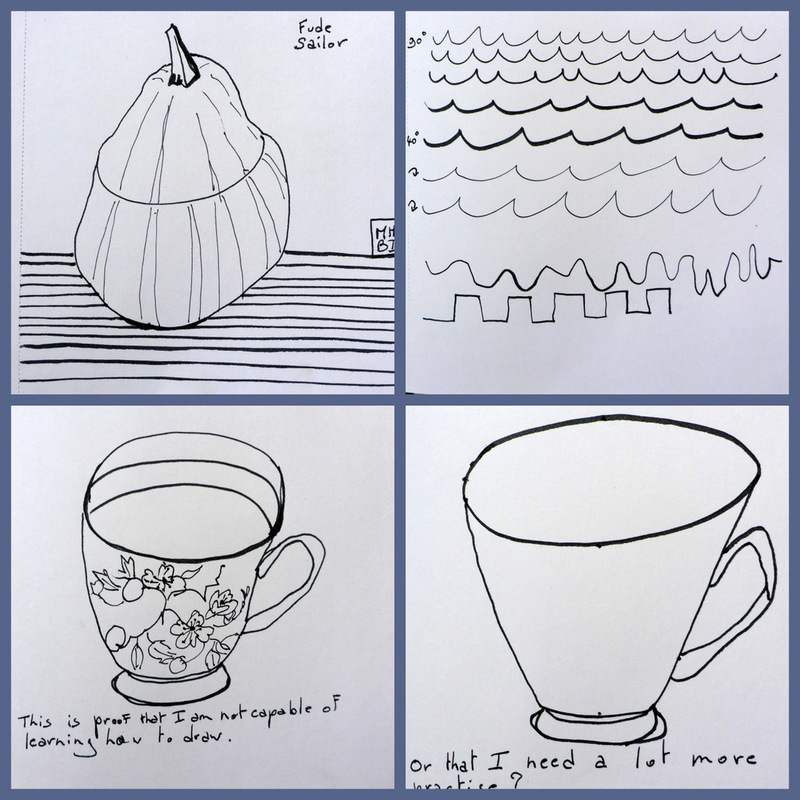 A few days ago, a friend gave me a gourd that had survived since Halloween, and a few pretty tea cups. So, here they are, immortalised. I have the feeling I will sketch a few more versions. This was so much more fun than my current attempts at watercolour painting! Here is the original pen drawing (no pencil, no thinking). And with watercolour and pencil. I like how the pencil brightened up dull areas. I got a set of Kooh-i-noor pencils for Christmas, and I get the feeling they're going to be part of my standard set! They are so much fun to play with! A few pictures from our walk on New Year's Day. Easterly wind, choppy seas, b***y cold. It didn't stop the swimmers! Apparently, ten minutes is as much as you should stay in the water when it's cold. Probably less if it's really cold, like in Russia. Here, the temperatures rarely go below zero celsius. But it's the wind!